Just three fresh ingredients are needed to make this refreshingly fresh juice recipe. 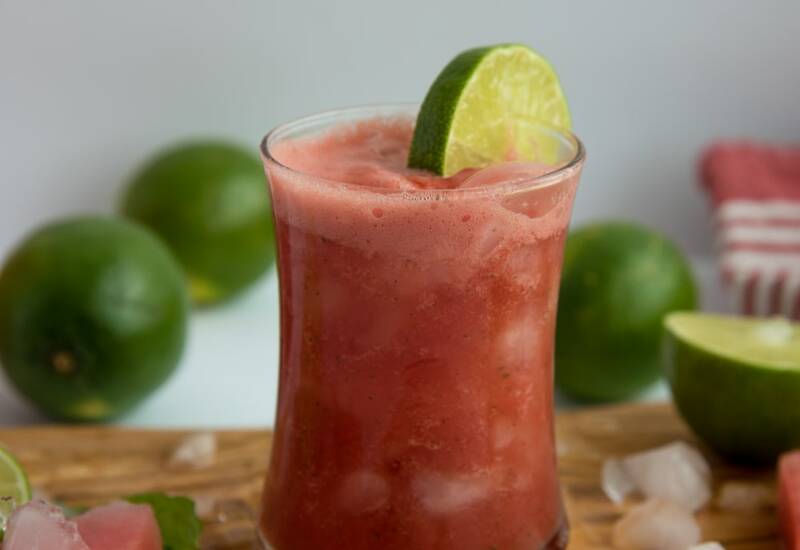 Sweet from the watermelon, tangy from the lime juice, and refreshing from the mint, you've got all the important flavor profiles covered. It’s perfect for a hot afternoon thirst-quencher; mix in tequila or vodka and serve over ice for a fresh cocktail. Make a big batch and store refrigerated in canning jars for up to two days; just shake before drinking because they will separate. Freeze your watermelon chunks for a few hours to give it a thicker texture and add a little more coldness. Or if you are short on time, add ice cubes! Swap in cantaloupe or honeydew for the watermelon for a different melon flavor. Lemon can be used in place of the lime. Add just a few cilantro leaves for a new flavor and fresh ginger for a spicy kick. Per Serving: 34 calories; 0g fat; 9.5g carbohydrates; 1g protein; 0mg cholesterol; 2mg sodium. I did not wait for next summer to try this as I can not pass up a refreshing watermelon drink anytime of the year. The addition of the mint is a must. After our virgin one, we added vodka to the next couple of glasses! I found watermelon so cheap at the grocery store so I decided to make this juice. It was so delicious! Next time I might try adding a little rum or vodka!